Indulging in a refreshing bath is often a quick-fix treat for our well-being and pleasure. 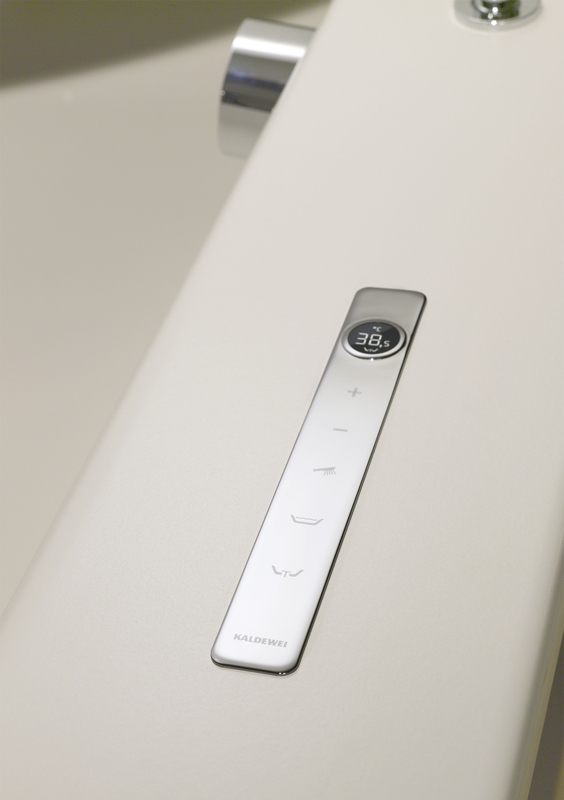 Taking a bath has now become even more comfortable with the new Kaldewei Comfort Select. Harmonised to blend perfectly with the design baths in its Avantgarde and Ambiente range, Kaldewei for the first time offers an electronic fitting with digital, user-friendly operating panel to regulate water inlet and outflow, water temperature, and shower or bath function. The Kaldewei Comfort Select system consists of three components, which can all be individually combined: an operating panel with electronic control unit, drain and overflow fitting, and a shower hose. The Kaldewei Comfort Select was designed by the noted Phoenix Design office, which has engaged in successful cooperation with Kaldewei for many years now and recently received the German Design Award 2012. The operating panel of the Kaldewei Comfort Select with electronic control unit integrates virtually flush into the rim of the bath and allows precise setting of the desired temperature even before running the water. Whether the default 38.5°C, warmer or cooler: the bath fills from the very first second with water of a consistently even temperature which can, of course, be easily adjusted in increments of 0.5°C at any time at the tip of a finger. For safety reasons, the maximum temperature is set to 43°C, but can be increased up to 50°C by pressing a special button combination. Along with the temperature, the operating panel of the Kaldewei Comfort Select also regulates the water inlet and outflow. The drain cover opens and closes at a gentle touch of the function symbols on the chromium-plated operating panel. The bath can be filled in two ways: via a standard, external bath tap or using the special Kaldewei Comfort Select drain and overflow fitting with fill function. The latter is electronically controlled and fills the water through a spout integrated in the overflow. As a further function, the Kaldewei Comfort Select operating panel electronically controls the shower function with the Kaldewei Comfort Select shower hose. The hose can be fitted with any shower head matching the overall design and either be sunk in the bath rim or fitted to the outside as a highly elegant eye-catcher on free-standing baths. The concealed shower hose also scores on technical points in that the hose duct with drip facility ensures optimal drainage of residual water. 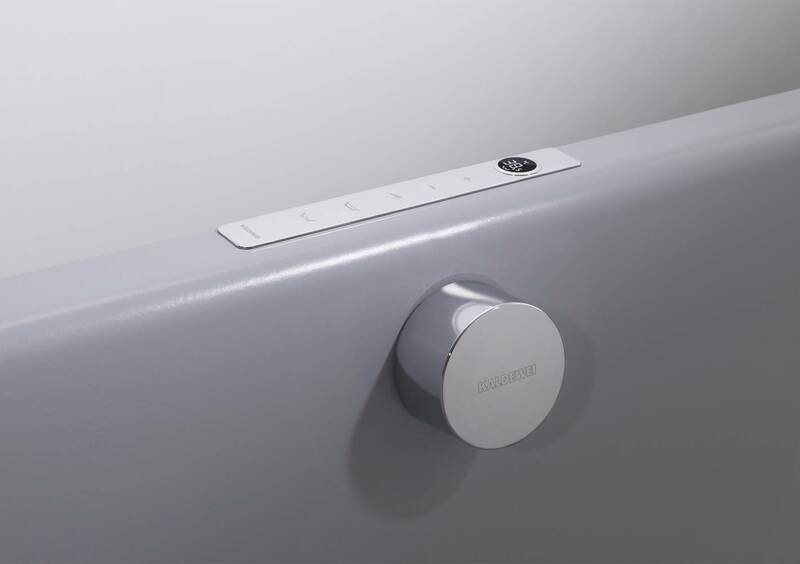 The Comfort Select System is the first range of electronically controlled fittings for Kaldewei design baths in the Avantgarde and Ambiente range. 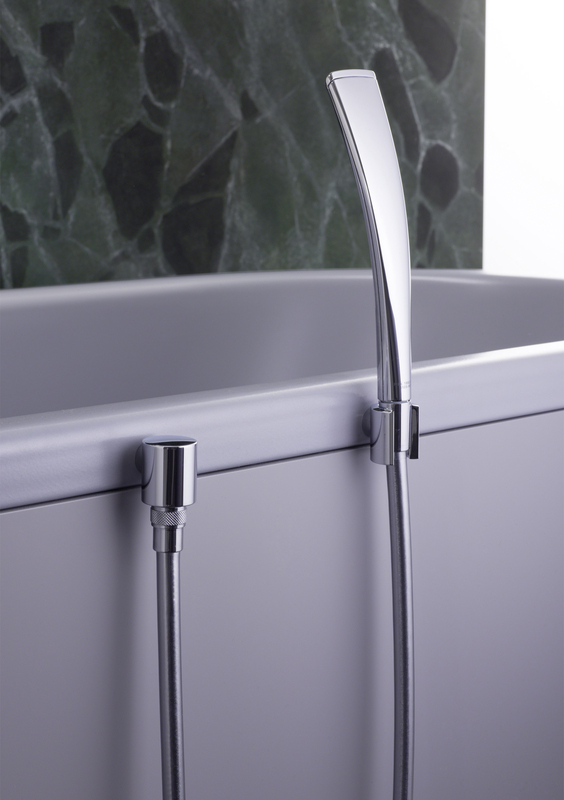 The Comfort Select System consistently continues the purist design and clear stylistic features typical of Kaldewei’s quality products – to provide an accessory which complements the company’s steel enamel baths and blends function and aesthetics in perfect harmony while being quick and easy to install. 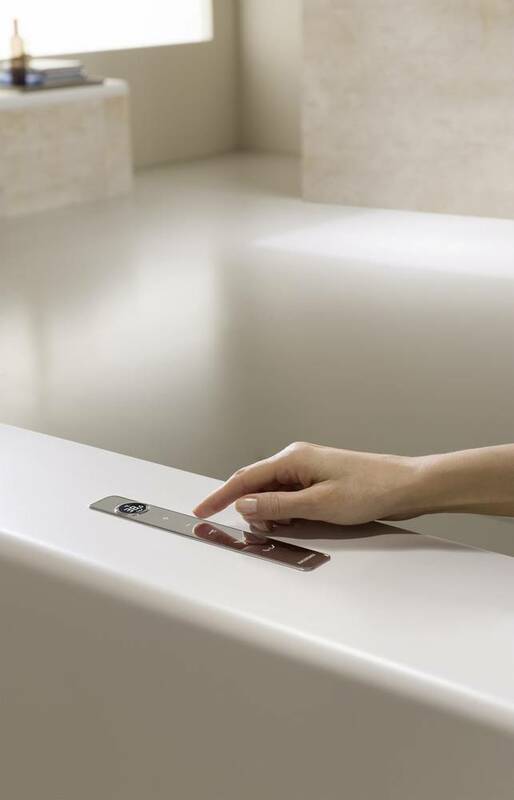 The operating panel of the Kaldewei Comfort Select with electronic control unit integrates virtually flush into the rim of the bath and allows precise setting of the desired temperature even before running the water. Kaldewei’s Comfort Select drain and overflow fitting with fill function is electronically controlled and fills the water through a spout integrated in the overflow. 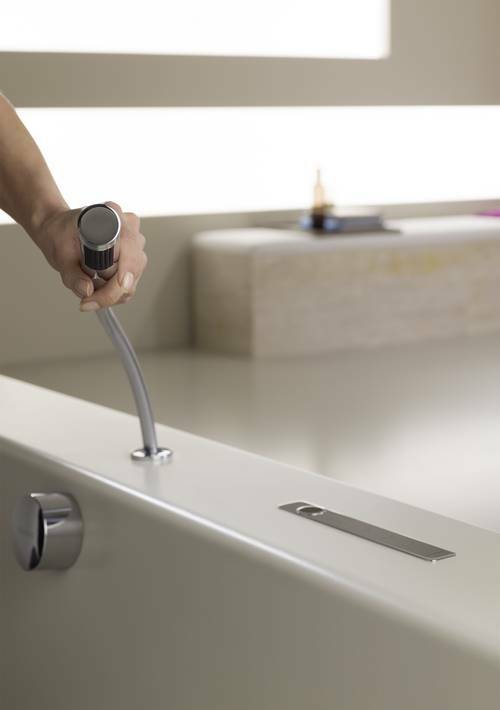 As a further function, the Kaldewei Comfort Select operating panel electronically controls the shower function with the Kaldewei Comfort Select shower hose. The hose can be fitted with any shower head matching the overall design and either be sunk in the bath rim or fitted to the outside as a highly elegant eye-catcher on free-standing baths. Indulging in a refreshing bath is often a quick-fix treat for our well-being and pleasure. Taking a bath has now become even more comfortable with the new Kaldewei Comfort Select. Harmonised to blend perfectly with the design baths in its Avantgarde and Ambiente range, Kaldewei for the first time offers an electronic faucet with a digital, user-friendly operating panel to regulate water inlet and outflow, water temperature, and shower or bath function.